Few people living here today realize that Raleigh once had its own roller coaster. RALEIGH, N.C. (WTVD) -- Few people living here today realize that Raleigh once had its own roller coaster. And amongst those who do know the story of Bloomsbury Park -- its original location is still debated. Driving through an unassuming historic neighborhood, one might never guess that hiding beneath the wild-grown kudzu and trees rests the remains of a century-old theme park. Over 100 years of development and history have obscured Bloomsbury Park's original location. As a popular "trolley-park," it was built as the final stop at the end of the Glenwood Avenue trolley system, owned by CP&L power company. In that era, trolley systems all over the country often built parks and attractions to encourage more people to ride. With over 8000 twinkling electric lights, Bloomsbury Park boasted a sizable roller coaster, carousel, and boat rides. Heralding an orchestrated dance pavilion, ice cream parlour, and loads of picnic areas, the scene at Bloomsbury Park was described as "metropolitan" by bustling crowds. When the park opened in 1912, The Raleigh Times expressed "Bloomsbury Park is exactly what Raleigh needed," with plans to become "the most notable amusement point in North Carolina." In 1918, American soldiers training for WWI camped out Bloomsbury Park -- a stark reminder of the ugly war taking place outside the sparkling lights and cheery carousel music. By 1920, with the shadow of World War I behind us, Bloomsbury Park was empty. Newspapers wrote, "the scenic railway at Bloomsbury Park is still there, though the place has been abandoned for nearly three years." 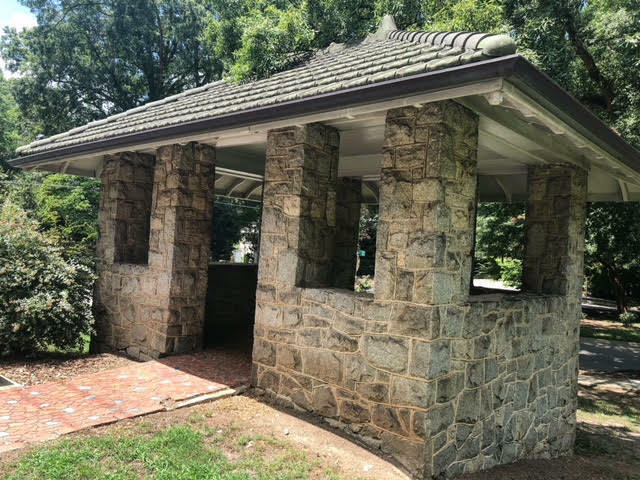 Through careful exploration of maps, archives, and historic landmarks, I was excited to discover actual remains of the original Bloomsbury trolley stop and dance pavilion still exist today, hiding in unexpected parts of Glenwood's neighborhoods. So I set off on a mission to explore what happened to the lost remains of Bloomsbury Park: The roller coaster, the carousel, the trolley stop, and the dance pavilion. You can still occasionally catch a glimpse of Raleigh's original trolley tracks during road construction and repairs along Glenwood Avenue. Many of the tracks are buried, dormant beneath modern pavement. According to Douglas Porter, the Historic Sites Program Director for the City of Raleigh, the trolley -- or streetcar -- system was in place from 1886 until 1933. During this era, many people still rode horses and wagons around Raleigh's streets. The trolley system grew in response to the industrialization of Raleigh, as well as the expansion of the suburbs. At this time, Raleigh's first and second wave of suburbs were being built outside the downtown area, including the neighborhoods around Five Points, such as Hayes-Barton and the Bloomsbury district. The streetcar went straight up Glenwood, "most likely," says Porter, "picking up men riding from those neighborhoods into downtown for professional opportunities - lawyers, doctors, or even warehouse laborers." "Bloomsbury Park," he explains, "was built by the power company as a strategic move to get people to ride the trolley," specifically on the weekends when people didn't need to ride to work. Bloomsbury Park, also known as "the electric park," was popular enough to keep the trolley in service on the weekends, as well. According to Porter, Raleighites at the time described Bloomsbury Park as "having quite the Coney-Island touch." I drive down Glenwood Avenue where the trolley system would have gone, and pull into the neighborhood where Bloomsbury Park once stood, not too far from the remaining historic stone trolley stop near Five Points. There I see an even older trolley stop -- one that has been hiding-in-plain-sight in someone's front yard for over a century. 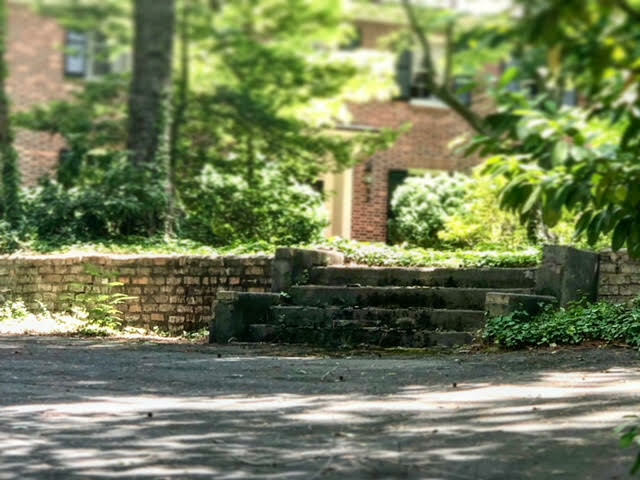 History author and English professor David Fleming, whose history of Bloomsbury Park inspired the first parts of my research, had emailed me about this old brick platform and staircase in the front yard of a neighborhood home. The historic rumor mill had told him it might be part of Bloomsbury Park. I park my car and begin to walk down the neighborhood streets, trying to get a closer look at this relic from the past. Helpful neighbors began sharing their own oral history and neighborhood lore. Maggie Gordan pauses from her daily walk to tell me, "Oh yes. That platform is the original stairs and trolley stop for the trolley car. At least, that's what the word around this neighborhood is." Fred Thornhill, another neighbor, added his thoughts: "Yes, that is the trolley platform, and this land also had the carousel and a roller coaster! This entire neighborhood has all kinds of buried history." Gordan gestures across the creek that runs through the neighborhood. "I've always heard the carousel was over there, across the water. It would have sat on that fairway." "At least," she says, "That's the story that's been passed down in this neighborhood." Those oral histories are, in some cases, all we have left to go on. The carousel at Bloomsbury Park is still around; in fact, you have probably ridden it yourself. In 1920 Bloomsbury sold their carousel, which had cost them over $10,000, to Pullen Park for roughly $1,500. While Bloomsbury had been in decline, Pullen Park had been growing. 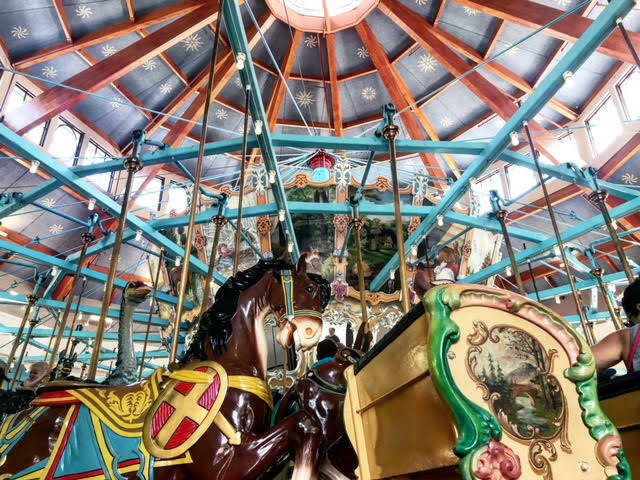 This beautiful remnant of Raleigh's childhood is, according to the National Park Service's Registry of Historic Places, recognized as one of the foremost surviving works of the Pennsylvania Carousel Company, founded by Gustav A. Dentzel. An immigrant from Germany, his business was famous for crafting carousels that still spin all around the United States. Dating back to the early 1900's, the Bloomsbury--and now Pullen--Park carousel is one of Dentzel's earliest creations. The carousel has enjoyed much fame throughout its long life. The Village Subway, another amazing piece of Raleigh history, lost and abandoned for decades beneath Cameron Village, has a unique connection to the carousel, and therefore to Bloomsbury Park itself. In 1982 the Raleigh band Glass Moon, renowned for their shows underground in the Village Subway, created a music video that takes place in Pullen Park. While the carousel animals were being restored they gained a starring role in "On a Carousel," which aired on HBO's Video Jukebox and gave the antique Bloomsbury carousel a national spotlight. Remains from the dance pavilion at Bloomsbury Park still exist today, perhaps the most sizable standing structure remaining from the park. 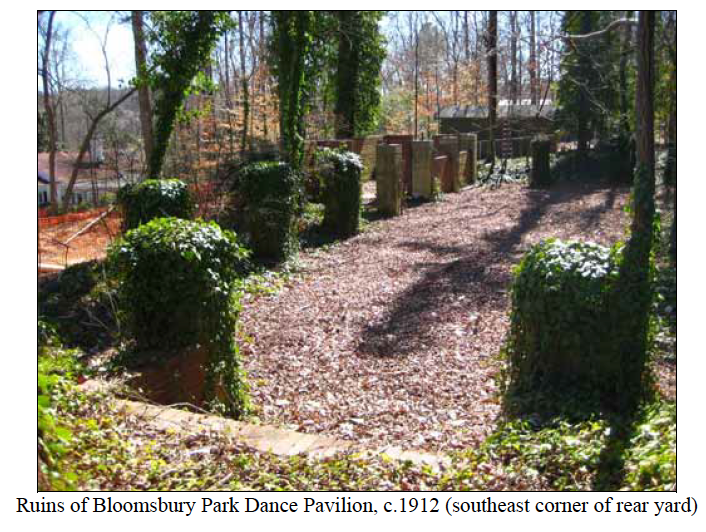 In Fleming's article, in which he seeks the original location of Bloomsbury Park, he writes "the best evidence...found for the location of Bloomsbury Park is from the 2008 nomination of the 1953 Bill and Betty Weber House Raleigh Historic Landmark status. The document includes striking photographs of the Weber's backyard, with visible ruins of the Bloomsbury Park Dance Pavilion." Hoping to catch a glimpse or get a photo of the pavilion remains today--and perhaps see where my Great Grandmother once danced on dates with my Great Grandfather--I reached out to the current homeowner several times. I was unable to reach her. However, if you wish to see a picture of how the dance pavilion ruins appear today, you can find it here on Fleming's website. According to the original Historic Landmark Designation Application, "the concrete piers and brick curtain walls are all that remain of the pavilion, and they outline the original size of the structure, which was approximately eighty-feet wide by sixty-feet long. The piers stand approximately eight feet high." The park's buildings were "left to ruin." Most of the remains were razed in the 1940's and 50's, as the neighborhood developed. My grandmother always told me that Bloomsbury Park was located where the Carolina Country Club sits today. The neighborhood oral history places the carousel on the wide open fairway of the golf course. Alternatively, Fleming states, "as a child attending Aldert Root Elementary School on Lassiter Mill Road, we were told the park had been on the grounds of our school." However, judging from the location of the trolley stop and dance pavilion ruins, Bloomsbury Park was not located in either of these locations. This makes sense historically, too, since the Carolina Country Club was established in 1910, and would have sat alongside Bloomsbury Park when the park was still in use. This map of Bloomsbury Park indicates the locations of the roller coaster, dance pavilion, and trolley stop; however, as it shows no other indicators such as modern street names, it can be difficult to place where this precise location was. But using the modern locations of the dance pavilion and trolley stop ruins as a guide, one can get a very good idea of where exactly the roller coaster, carousel, and other beloved pieces of Bloomsbury Park once rested. In fact, if you happen to live in this area, you might be surprised to see the roller coaster once ran through your own backyard! The Historic Landmark Designation Application for the Weber House and its backyard dance pavilion adds, "some remains of other buildings of the park are said to remain in the neighborhood." The neighborhood's winding roads and steep ravines are curtained by heavy brush and thick kudzu. I strolled along the sidewalk, trying to catch glimpses down the hills and deep into the trees. Like trolley tracks hiding beneath the pavement of Glenwood Avenue, I wonder what bits of Bloomsbury history rest hidden beneath all the foliage. Featured image: "Roller Coaster in Bloomsbury Park, Durwood Barbour Collection of North Carolina Postcards #P0077, North Carolina Collection Photographic Archives, The Wilson Library, UNC-Chapel Hill." 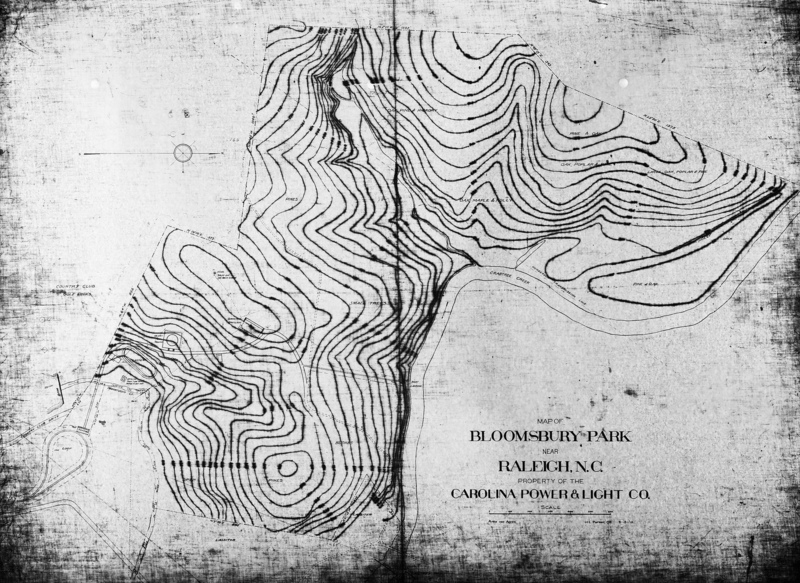 Map of Bloomsbury Park, courtesy of the State Archives of North Carolina. More photos of historic Bloomsbury Park can be found here. Heather is an ABC11 Community Influencer. Read more of her work on her blog.